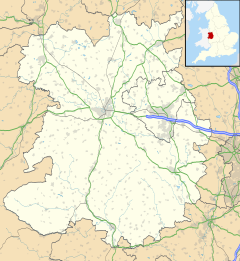 Ellesmere (/ˈɛlzmɪər/ ELZ-meer) is a market town near Oswestry in north Shropshire, England, notable for its proximity to a number of prominent lakes known as the Meres. Ellesmere Castle was probably an 11th-century motte-and-bailey castle most likely built by either Roger de Montgomerie, 1st Earl of Shrewsbury, or his son Roger the Poitevin at Castlefields overlooking the Mere. Only its earthworks now remain, with the top of the motte being used for the bowling green, which still commands a fine view. In 1114, King Henry I gave Ellesmere to William Peverel as a part of the Maelor, which included Overton & Whittington at that time. His descendants retained Ellesmere until apparently the late 1140s when the lordship was acquired, probably by force, by Madog ap Maredudd of Powys. Madog died in 1160 and Ellesmere came into the hands of King Henry II. In 1177 King Henry II gave the manors of Ellesmere and Hales in England to Dafydd ab Owain Gwynedd (who already had a castle at Rhuddlan and was, by this time, the sole ruler of Gwynedd. Earlier, in the summer of 1174, Dafydd had married Emme of Anjou, half sister of Henry, and sister of Hamelin de Warenne, Earl of Surrey, both illegitimate children of Geoffrey V, Count of Anjou). Dafydd remained Lord of Ellesmere until his death in 1203. In mid-April 1205, Llywelyn the Great married Joan, Lady of Wales illegitimate daughter of King John and Ellesmere was given to them as a wedding gift. Llywelyn's mother was Marared (Margaret), daughter of Madog ap Maredudd, Prince of Powys. There is evidence that, after her first husband Iorwerth's death, Marared married in the summer of 1197, Gwion, the nephew of Roger Powys of Whittington Castle. She seems to have pre-deceased her husband, after bearing him a son, David ap Gwion, and therefore there can be no truth in the story that she later married into the Corbet family of Caus Castle (near Westbury, Shropshire) and later, Moreton Corbet Castle. Ellesmere was ordered to be attacked by King Henry III in 1231, but Llywelyn retained control of the lordship until his death in 1240. In 1241 King Henry III ordered John le Strange to repair the wooden castle of Ellesmere. The lordship appears to have later passed into the hands of Llywelyn ap Gruffudd or his brother Dafydd ap Gruffydd, grandsons of Llywelyn ab Iorwerth and last of the native Princes of Wales. The castle fell to royal troops from Chester during March 1282. In 1287, Oliver Ingham, who was an English commander and administrator in Aquitaine during the War of Saint-Sardos and early Hundred Years War was born in Ellesmere. His daughter Joan married Robert ("Roger") le Strange, 4th Baron Strange, son of Lord Strange of Knockin & Isolda de Walton. In 1435, Griffin Kynaston, Seneschal of the Lordship of Ellesmere, (born at Stocks of landed gentry – descended from the princes of Powys), gave evidence at Shrewsbury to confirm the age of John Burgh, Lord of Mowthey, sponsored by Lord John Talbot, 1st Earl of Shrewsbury, Lieutenant of Ireland. Griffin's fourth son, Sir Roger Kynaston, was appointed for life as Escheator and Sheriff of Merioneth and became Constable of Harlech Castle and Sheriff of Shropshire. Humphrey Kynaston, the son of Roger and his second wife Elizabeth Grey was, in 1491, declared an outlaw by King Henry VII and took shelter in a cave in the west point of Nesscliffe Rock, called to this day "Kynaston's Cave". He was pardoned in 1493. The former Marcher Lordship of Ellesmere (formerly a Hundred in its own right) was annexed to Shropshire and the Hundred of Pymhill by section 11 of the Laws in Wales Act 1535. Francis Egerton, 1st Earl of Ellesmere and Viscount Brackley, was born Lord Francis Leveson-Gower, in Ellesmere in 1800. A patron of the arts, in 1848 he purchased at auction for 355 guineas from the estate of Richard Temple-Grenville, 2nd Duke of Buckingham and Chandos, the only known (or suspected) portrait of William Shakespeare in existence. Ellesmere Island in Canada was named after him. There was a tannery located on the edge of the Mere in what is now known as Cremorne Gardens. These gardens were given to the people of Ellesmere by Lord Brownlow who was heavily involved in the Edward VIII abdication crisis of 1936. The town is located by the side of 'the Mere', one of the largest natural meres in England outside the Lake District and one of nine glacial meres in the area. ('glacial' means that the depression occupied by the mere was the location of a block of ice that persisted at the end of the last Ice Age). These meres are different from those in the Lake District in that they do not have a flow of water into them to maintain the level. An artificial island in the Mere was constructed in 1812 from soil dug out during the making of the gardens at Ellesmere House. This was later named Moscow Island, as Napoleon was forced to retreat from Moscow that year. The Mere has a visitors' centre and is popular with birdwatchers, many of whom visit to see grey herons nesting. There are eight other meres nearby: Blakemere, Colemere, Crosemere, Kettlemere, Newtonmere, Whitemere, Sweatmere and Hanmer Mere. The civil parish which constitutes the town is Ellesmere Urban; the surrounding parish, covering a large rural area, is Ellesmere Rural. The A495 and A528 roads cross at Ellesmere. The latter runs 15 miles south-southeast from Ellesmere to the county town, Shrewsbury. The town lies beside the Llangollen Canal with a short side arm reaching the town centre wharf. The canal eventually terminates just outside Llangollen at Llantysilio after passing through the 18 km World Heritage site which includes Chirk Aqueduct and Pontcysyllte Aqueduct. It was originally known as the Ellesmere Canal. Thomas Telford was overall director of its construction. Work lasted from 1793 to 1805 with the aim of linking Chester on the River Dee and the River Mersey at Ellesmere Port (named after the town) with Shrewsbury, but it never got that far due to rising costs and completion of alternative routes which later became the Shropshire Union Canal. During its construction, Telford lived in a house next to the canal in Ellesmere, which still stands today. Ellesmere no longer has a railway, but it was once on the Oswestry, Ellesmere and Whitchurch Railway main line of the Cambrian Railways. However, the section from Whitchurch to Welshpool (Buttington Junction), via Ellesmere, Whittington, Oswestry and Llanymynech, closed on 18 January 1965 in favour of the more viable alternative route via Shrewsbury. Ellesmere was also the terminus of the Wrexham and Ellesmere Railway branch line to Wrexham (Central), via Overton-on-Dee, Bangor-on-Dee and Marchwiel. This line closed on 10 September 1962. Ellesmere railway station still stands albeit derelict and disused. The nearest station to Ellesmere is Gobowen for Oswestry which less than 2 miles away. 501 to Shrewsbury via Cockshutt, Myddle (most but not all) and Harmer Hill – roughly hourly (Lakeside coaches). St Mary's Church – of Norman origin but largely rebuilt by Sir George Gilbert Scott in 1849. A grade I listed building. Ellesmere Old Town Hall – Ellesmere's most notable building, built in 1833. A grade II listed building. Oteley Hall and Park, built for Charles Kynaston Mainwaring in 1827. Re-built during the 20th century after a fire destroyed the building. The town has two schools. Ellesmere Primary School is a primary and nursery school for boys and girls aged 4–11. Lakelands Academy provides state-paid education for boys and girls in the 11–16 age range (for whom schooling is compulsory) and its former pupils include Luke Preston. Several other nearby schools serve the wider community, such as Welshampton Church of England School, which recently scored among the highest in the country in OFSTED reports in all categories. A short distance outside the town is Ellesmere College, a public (i.e., private) boarding school founded in 1884 by Canon Nathaniel Woodard for sons of the middle classes. It is now a fully co-educational school catering for pupils from 7–18. Lakelands School formally known as Lakelands School Sports and Language College, is located on Oswestry Road. In 2013 Lakelands School became an academy. Sports clubs in Ellesmere include Ellesmere Cricket Club, one of the oldest in north-east Shropshire, which after a number of years in the doldrums is on the rise with a successful first XI which was runner up in the Shropshire Cricket League Division 4 in 2006 and were Division 3 champions in 2007 and were promoted to the First Division as second division runners up at the end of the 2008 season. Ellesmere Rangers Football Club competes in the Midland Football Alliance. Dafydd ab Owain Gwynedd (c. 1145–1203) was given the manor of Ellesmere and Hales by King Henry II in 1177. Joan, Princess of Wales (c. 1191–1237) illegitimate daughter  of King John, was married to Llywelyn the Great and given Ellesmere as a wedding gift in 1205. David Holbache (c.1355–1422/23), Welsh politician,  best known for founding Oswestry School in 1407. Thomas Telford FRS, FRSE (1757–1834) lived in Ellesmere  in 1790s during construction of Llangollen Canal. Dorothy Buxton (née Jebb) (1881 in Ellesmere – 1963) humanitarian,  social activist and commentator on Germany. Francis Egerton, 7th Duke of Sutherland (born 1940) peer,  became 6th Earl of Ellesmere in 2000. Arthur Topham (1869 in Ellesmere – 1931) footballer,  1 England cap, played for Casuals F.C. ^ "Ellesmere Urban (Parish): Key Figures for 2011 Census". Neighbourhood Statistics. Office for National Statistics. Retrieved 25 November 2015. ^ Archaeological Society, British (1871). "Collectanea Archaeologica": 223. ^ Chisholm, Hugh, ed. (1911). "Ellesmere" . Encyclopædia Britannica. 9 (11th ed.). Cambridge University Press. p. 291. ^ Chisholm, Hugh, ed. (1911). "Telford, Thomas" . Encyclopædia Britannica. 26 (11th ed.). Cambridge University Press. p. 573. Collins, Martin; Collins, Fran (2017). U.S. Army Hospital Center 804: An Account of the U.S. Military Hospitals in the Shropshire/Flintshire Area during World War. Brewin Books. ISBN 978-1-85858-565-9. 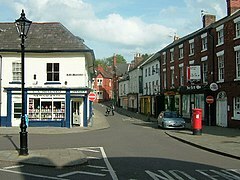 Wikimedia Commons has media related to Ellesmere, Shropshire. Wikivoyage has a travel guide for Ellesmere.